Therefore, one finds that Islam presents the just and balance way in every aspect of life. Not only that, it also warns against heading towards either extreme: that of excessiveness and negligence. Allah says, "Guide us to the straight way, the way of those upon whom You have bestowed Your grace, not those whose (portion) is wrath nor those who have gone astray" (al-Faatihah 1:6-7). 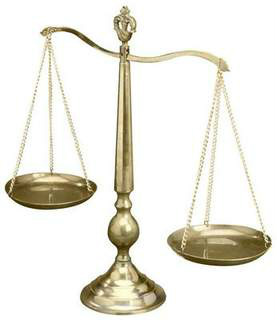 The words in the verse above, "a nation justly balanced (ummah wasata)," means "equity and most excellent." This explanation [for the verse 2:143] is also apparently what the early scholars of Quranic exegesis stated, including ibn Abbaas, Mujaahid, Saeed ibn Jubair, Qataadah, as well as others of the later Quranic commentators. Allah says, [Believers], you are the best community singled out for people: you order what is right, forbid what is wrong, and believe in God. If the People of the Book had also believed, it would have been better for them. For although some of them do believe, most of them are lawbreakers - (ali-Imraan 3:110). Quranic verses explain each other. Since the Quran describes this nation as "the best," its description as "wasat" must necessarily follow because "wasat" in the Arabic language means "the best, most excellent, and fair." This usage is customary in the speech of the Arabs, that is, that "wasat" means equity. Thus, equity means to follow all the teachings of Islam, and to practice them in accordance to the way it was given, without going beyond the limits which have been set by Allah and His Messenger (peace be upon him). A Muslim believes that Islam is complete and perfect in all its teachings. The laws given in the Holy Quran are exactly what Allah wanted for the believers. The completion and perfection of Islam means that whatever constitutes its teaching is exactly what a Muslim is required to do, as part of his duty to Allah. Today I have perfected your religion for you, completed My blessing upon you, and chosen as your religion Islam: [total devotion to God]; but if any of you is forced by hunger to eat forbidden food, with no intention of doing wrong, then God is most forgiving and merciful. [Part of al-maidah 5:3] Violation of God’s laws and teachings amount to sins and transgression, and does not amount to ‘moderation’. Furthermore, the Prophet (peace be upon him) used to repeat in supplication “Our Lord! Give us good in this world and good in the Hereafter, and defend us from the torment of the Fire!” The ideal situation in Islam is neither deprivation nor excessive materialism but justly balance. Equity cannot be a mere human criterion for virtues. Instead, it is a distinguishing characteristic of the Quran. It is the Quran and its faithful adherents who are truly the people who are free of deviation, with respect to both excessiveness and negligence. The foundation of the religion of Islam is the antithesis of extremism. It is the religion of equity as defined by God Almighty the All Wise and not subject to whims of Man - be they clergy or laity. The Quran expounds the centrality of equity within every aspect of Islam and thus, enables one to authoritatively discern the objectives of Islam and thereby aids in countering extremism.